Let DLM Marketing show you how email marketing can help your business grow. At DLM Marketing we have been running email marketing campaigns for multiple companies for many years and we have discovered a few simple methods that improve the response rate from them. There is a growing attitude towards email marketing that it’s not effective and can be considered to be annoying. However email marketing remains the second biggest way to acquire new customers, after organic search. Email marketing helps you keep your business at the forefront of consumer minds and offers an opportunity for follow-up, which can lead to an increase in sales. 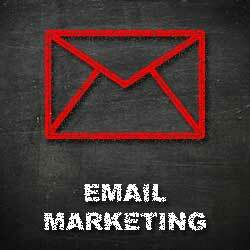 Email marketing also increases referrals and builds strong relationships with potential and current customers. If you’re NOT using email marketing in your business, then you’re missing out on an extremely valuable opportunity to market your business. Customers like to receive emails from trusted companies, and will generally open them. With so many eyeballs on your message, how could you afford to give up email marketing? Report provided after campaign has been executed. We normally allow up to 3 working days before drafting this report. Please note: Our fees do not include the costs incurred from third party providers.